On April 30, 1984 two of the United States Football League’s top rookie quarterbacks went head-to-head as the Houston Gamblers hosted the Los Angeles Express in a Monday night game at the Astrodome. The Gamblers, coached by Jack Pardee in their first season in the USFL, were off to a 6-3 start and had a chance to take sole possession of first place in the Central Division since both the Michigan Panthers and Oklahoma Outlaws had lost the previous day. QB Jim Kelly was performing very well operating in a run-and-shoot offense and had fine targets to throw to in wide receivers Richard Johnson and Ricky Sanders. The Express, meanwhile, had gotten off to a miserable 2-5 start but improved to 4-6 for the most part thanks to the addition of QB Steve Young (pictured above). Head Coach John Hadl’s team had averaged just 10.7 points per game prior to the mobile lefthander taking over at quarterback, and his presence was making a difference in the team’s offensive production. There was a crowd of 30,727 fans on hand for the nationally-televised contest. The Gamblers took the opening kickoff and drove 57 yards in eight plays, reaching the end zone on a seven-yard touchdown pass from Kelly to Richard Johnson. On their initial possession, the Express came right back with an 86-yard series that ended with a four-yard scoring pass from Young to RB Tony Boddie. Late in the second quarter, DT Eddie Weaver returned a fumble 22 yards for a TD to put LA in front. Houston responded by driving 90 yards in eight plays. Kelly threw to Ricky Sanders for a 14-yard touchdown with 34 seconds left on the clock and, with all extra point attempts successful, the score remained 14-14 at the half. In the third quarter, the Express drove to the Houston one but, on fourth down, Coach Hadl decided against a chip-shot field goal attempt and called for a quarterback sneak. While unsuccessful, an offside call on the Gamblers gave the Express another shot and RB Mel Gray carried and appeared to score, but officials ruled that he was short. On the first play of the fourth quarter, Houston took the lead on a four-yard touchdown carry by RB Todd Fowler. It finished off a 67-yard drive that was helped along by a pass interference penalty. The home team was up by 21-14. Three minutes later, LA got on the board when Young passed to WR JoJo Townsell for a 17-yard touchdown. That capped a seven-play, 73-yard series. However, following a punt by the Express, the Gamblers went 87 yards. 39-year-old Toni Fritsch, the league’s oldest placekicker, booted a 26-yard field goal to again pull the Gamblers in front at 24-21. With time running down, the Express put together a drive in which Young completed key passes to Boddie, the second for 19 yards, and scrambled for 15 yards for a first down at the Houston 28. Now down to four seconds left in regulation, Tony Zendejas kicked a 41-yard field goal to tie the score and send the game into overtime. In the overtime period, a decisive turnover occurred when safety Troy West of the Express intercepted a Kelly pass and returned it 16 yards to the Houston 44. It seemed as though the Gamblers still might dodge the bullet, but an incomplete pass by Young on third down was negated when DE Pete Catan was flagged for roughing the quarterback. That kept the drive alive at the Houston 27. Turning conservative, three plays gained three yards and Zendejas then came on to boot the game-winning 42-yard field goal at 4:41 into the extra period. Los Angeles came away with a big 27-24 win. The Gamblers outgained Los Angeles (412 yards to 373) and had more first downs (26 to 23). However, while the Express suffered no turnovers, Houston turned the ball over four times. LA’s defense also sacked Kelly seven times, to three sacks of Young. Steve Young completed 17 of 28 passes for 211 yards with two touchdowns and and also rushed for 56 yards on 6 carries. RB Kevin Nelson gained 89 yards on 18 rushing attempts. JoJo Townsell caught 5 passes for 75 yards and a TD. Tony Zendejas missed two field goal attempts but redeemed himself with the two clutch kicks. For the Gamblers, Jim Kelly was successful on 37 of 50 throws for 380 yards and two TDs but also had two interceptions. Richard Johnson (pictured below) set a league record with 15 pass receptions for 142 yards and a touchdown and Ricky Sanders added another 10 catches for 98 yards and a score. Todd Fowler was the leading ground gainer with 32 yards on 11 attempts. Coach Hadl’s words proved to be correct – the Express went on to win six of the next eight games to top the Pacific Division with a 10-8 record. They upended the defending-champion Michigan Panthers in triple overtime of their epic First Round playoff game but lost the Western Conference title game to the Arizona Wranglers. Meanwhile, the defeat kept the Gamblers from taking sole possession of first place in the Central Division, but they eventually did prevail with a 13-5 tally. They were upset in the First Round by Arizona. 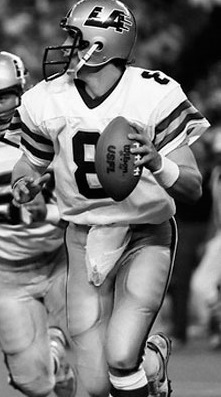 Steve Young, in the course of 12 games, passed for 2361 yards and also ranked second among USFL quarterbacks with 515 rushing yards on 79 carries. He passed for 10 touchdowns and ran for 7. 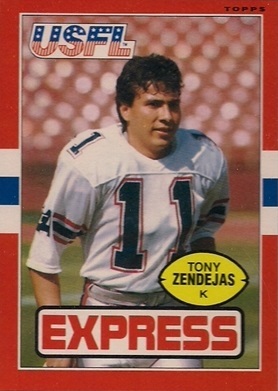 Tony Zendejas, a rookie out of Nevada-Las Vegas, was successful on 21 of 30 field goal attempts and all 33 of his extra point tries. Jim Kelly had a phenomenal rookie season, leading the league in pass attempts (587), completions (370), yards (5219), and touchdown passes (44), although also interceptions (26). He received MVP and All-League honors from the USFL. 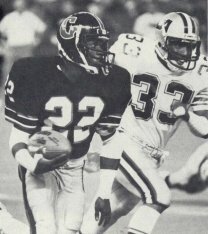 Richard Johnson also received All-League honors as he led the USFL in pass receptions (115) and scoring receptions (15) and was second in yards (1455). His record for catches in a game was broken by Gill Stegall of Denver, who had 16 in a game, also against the Express, in 1985.